In June 2012, NMBVAA members visited Kundasang & Ranau, the area used by the Japanese Imperial Army to assemble Allied POWs during the imfamous Borneo Death Marches in 1945. Please refer photos of the expedition on this website. For more information with respect to Prisoners of War, please refer to the Recommended Reading section of this website. 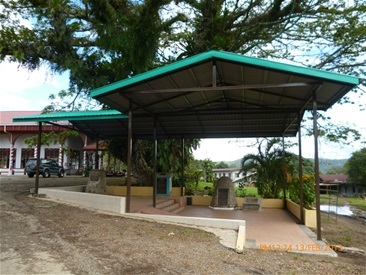 The Cairn at Ranau Town, said to be made up of 2,428 river rocks - the number of POWs who perished at the hands of the Japanese Army during WW2. Only six Australians survived. This is how the Ranau site looks now. The Borneo Exhibition Group WA applied for funds from DVA to have the cairn site covered. Well done, Ryan Rowland and his group...& thanks for the snap. Our thanks to Janice & Gary Blaxter for sending me these snaps from Boreo taken not long after the war. It should be noted that the bodies of Sandakan POWs recovered from the camp and the track to Ranau, were first buried at Sandakan. 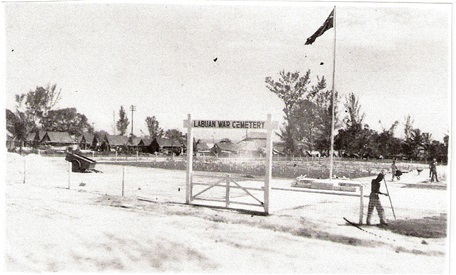 Later, it was decided that the cemetery at Labuan would be the final resting place for them. 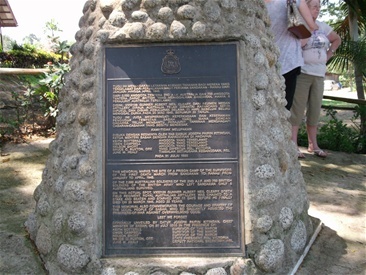 Japanese POW labour was used extensively to relocate the bodies of our diggers to Labuan. This picture was taken before the Japanese surrended in 1945. It is a Mitsubishi Medium Bomber K1-21, (US codename: Sally) the draft horse of the Japanese Army Air Force.